A monster-in-law wedding dress could ruin your special day. Like the character from the popular 2005 movie, Monster-in-Law, some future mothers-in-law enjoy terrorizing their sons' fiancées by dressing inappropriately on the wedding day. Monister-in-Law, the movie, was full of comedic satire beautifully acted by Jane Fonda and Jennifer Lopez. However, the real stars of the movie were the dresses worn by Lopez and Fonda. Use the gorgeous dress worn by Jennifer Lopez as inspiration for your own wedding gown, and hope that your mother-in-law does not show up in a replication of Jane Fonda's gown. Jennifer Lopez - The designer of the ivory dress worn by Jennifer Lopez was SaeYoung Vu Couture, an up-and-coming designer who works extensively in television and movies. This fitted formal gown is in elegant satin, and pools around the feet. Sleeveless, the bodice is in a scoop style with romantic folds at the top. The corset top shapes the waist and cleavage. Lopez wore her hair in an updo with a half veil at the back of her head. Long elbow length sleeves finished this outfit. Jane Fonda - Playing the perturbed monster-in-law, Fonda crashes the wedding wearing a white dress complete with feather embellishments. This strapless dress is white with an off the shoulder scarf accent. Under the bodice rests a rhinestone encrusted pin that makes this gown look stunning. However, the entire outfit is inappropriate for the mother of the groom. No matter how hard you shop for her or include her in the wedding dress shopping process, a real "monster-in-law" may use your wedding ceremony as her last wedding protest. Whatever her reasons are for becoming a monster, it is important to know what you are up against. Here are some no-no's that a monster-in-law may attempt to wear to a wedding. Matching Dresses - A mother-in-law becomes a monster-in-law when she decides to wear a dress that matches the bride. It is a bad idea. Do not be surprised if she shows up wearing a dress similar to the bride, down to the tiara. White Dresses - Everyone, except for the bride, should avoid wearing white. While some etiquette guides say ivory or cream colors are acceptable, the best advice is to ask everyone to pick a color, any color-other than white. Do not be shocked if the monster-in-law wedding dress is pure white. Black Dresses - An unhappy mother may appear in mourning or black clothing as a way to say, "Stop this wedding!" Besides wearing black, she may also wear a veil or black accessories. Although blac and white together is a classic look for anyone, all black is funeral wear. Club Wear - Some women have no concept of an appropriate mother of the groom dress code. She may appear wearing a short mini dress or an outfit that has a revealing bust line. This is by no means an exhaustive list of the inappropriate attire an inconsiderate mother-in-law might attempt to wear. A monster-in-law wedding dress can take away from your wedding pictures and even worse, your memories of this incredibly special day. While you cannot watch her every minute, there are some things you can do to stop the monster from ruining your day. Enlist the help of someone who knows her. Do not become a gossip, but ask for honest help. A future sister-in-law, aunt or husband may be a willing partner in this undercover assignment. Ask for updates to keep up with her plans to wreck the wedding. Respect your informant's position and keep your info to yourself unless you need to make a move. 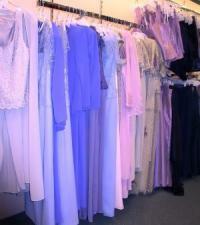 Buy an extra dress in case Mom does not follow proper dress etiquette for mother of the groom. Keep the receipts so you can return the dress if you do not need it. If the monster-in-law shows up for the wedding wearing something entirely inappropriate, then bring out the extra dress. Have a dress ready for her to wear and refuse to walk down the aisle unless the mother-in-law changes outfits. Delegate the responsibility of "monster-in-law" sitting to someone else. A bride should not be worried about what her sweetheart's mom will show up wearing. Ignore Mom's bad behavior. Like a toddler sitting in "time-out," this malicious mom will learn that her bad behavior will not garner her any attention. A monster-in-law wedding dress may give a new couple's relationship a black eye that is hard to overcome. Regardless of how Mom behaves, do not allow her to wreck the days after the wedding, which are far more important than the actual ceremony.